Make your milestone wedding anniversary special with our Anniversary party supplies! 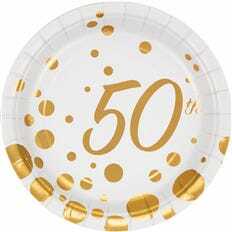 Featuring elegant gold 50th and silver 25th anniversary tableware and decorations you can create a memorable occasion to celebrate your years of marriage that you and your family and friends will cherish forever. A marriage that makes it through the years to a silver 25th or a golden 50th is a milestone that deserves a special celebration. Whether you and your husband are celebrating years of wedded bliss or you are planning a surprise wedding anniversary for mum and dad you can make a wonderful, memorable event with our Anniversary party supplies. 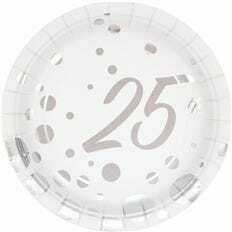 For a 25th wedding anniversary use our 25th Silver Anniversary Sparkle and Shine range - cover a table with our silver plastic tablecloth then add the 25th silver anniversary plates and napkins for an elegant party setting. Create some atmosphere by hanging up our silver chandelier decorations, our champagne bottle shaped balloons and some silver streamers, and finish off with a special thank-you gift in our silver gift bag with handles for each guest attending, such as an engraved photo frame of the happy couple for everyone to take home and treasure. If you're celebrating getting to the golden 50 years of marriage then a glittering gold celebration is a gorgeous way to celebrate such a grand milestone. Lay our gold tablecloth over a table and add the 50th Gold Anniversary Sparkle and Shine tableware on top to begin your beautiful gold theme. Next complement the theme with our gold foil confetti, gold foil spray centrepieces, some champagne balloons and gold streamers and you're ready to get into the celebration spirit. Order a cake with a gold bordered picture of the happy couple or have them shape it in gold numbers to suit your anniversary for an impressive dessert, and give each guest our gold drawstring bags with some gold-wrapped chocolates as a gorgeous thank you gift for attending your special event. For a Gold or Silver wedding anniversary celebration that is sure to be unforgettable shop our Anniversary party supplies.